RAP Series 24 CC with carbon filter from Electrocorp an industrial wing of AllerAir is the best solution for evidence rooms, property rooms, morgues, funeral homes, and health care industries, etc. The middle size of the RAP series. The primary difference between the RSU and the RAP is that the RAP has a wrap around the unit. RAP Series 24 CC with carbon filter from Electrocorp an industrial wing of AllerAir is the best solution for property rooms, evidence rooms, morgues, funeral homes, and health care industries, etc. The middle size of the RAP series. The primary difference between the RSU and the RAP is that the RAP has a wrap around the unit. These quality air purifiers are also excellent options for Evidence Rooms, Medical Marijuana Dispensaries, Morgues & Funeral Homes, and Hospitals too. "Electrocorp’s Radial Air Purifiers (RAP) series features some of the most versatile and effective air cleaners in the company’s diverse lineup of industrial-strength air purifiers. The RAPs are available in different sizes, from 23.5” height x 12” diameter up to 62” height and 22” diameter. They feature a deep-bed activated carbon filter for the removal of chemicals, gases and odors as well as an electrostatic particle filter or a Super-HEPA. The powerful micro-HEPA + carbon combination gives these air cleaners one of the largest and most extensive adsorbent areas, allowing them to capture odor-causing pollutants more efficiently than other units. The RAP air cleaners can accommodate 15 to 120 pound activated carbon filters and can be customized even more with regards to the filter media and carbon blends. The RAP units are portable, free-standing, plug-and-go air purifiers with a round design for maximum efficiency. They are engineered for around-the-clock operation with a quiet, modern design. The main body of the air purifier is covered by metal mesh housing, combining a large-volume air intake with robust and protective features. Optional UV lamp for added protection is available. The RAP 24 is a compact, highly-portable industrial-strength air purifier perfectly suited for maintaining high air quality for applications such as: law enforcement evidence roooms, laboratories, odor control, printing and graphics shops, hospitals and other healthcare facilities, rough workshops, and many other applications. Also great for removing welding or soldering fumes in an enclosed room or space. 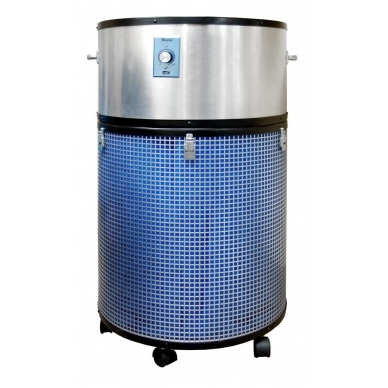 Features a 60 lb industrial-strength Vocarb carbon filter, a Micro-HEPA Wrap 99% that removes dust, fibers and particles as small as 1 micron, and a carbonized 10 micron pre-filter to effectively remove larger particles and chemicals before they reach the main HEPA and carbon filters, thus extending the life of those main filters. This industrial air cleaner also features a welded steel cage around the air purifier to prevent damage in a rough work environment or job site. 250 to 900 CFM delivered, with variable adustable speed!